The first company to purchase a license to produce scooter in India was A.P.I (Auto Products Of India) a Public Limited Company in based in Bombay. They started with Model D Lambretta's again under the agreement that they would only sell into their own country as so are virtually unknown outside India although they did manufacture spares for GP Lambretta's and you may well find the API stamp on GP parts. API moved more and more into the rickshaw market (known as tuk tuk in India) with many different versions of the various models made. In 1986 API had their existing models redesigned by Japanese design firm called Miyazu, but basically under the panels they were still a Lambretta. 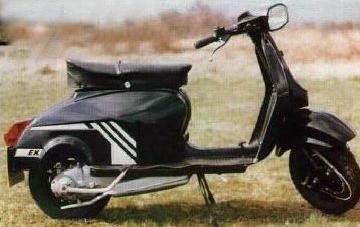 The licence to use the name Lambretta is held by SIL so API called their machines Lamby Polos. Although only manufactured as a 150cc machine based on the Li, the UK importers Bedlam Scooters also offered the Polo in 125cc (for the UK learner law), and a 175cc version with a larger carb. Another famous producer of Lambrettas, was the Indian Lambretta factory S.I.L. (Scooters India Ltd) based in Lucknow. S.I.L This was set up when Innocenti ceased production, by the Indian Government who went over to Italy in late 71 and purchased the whole factory set up. 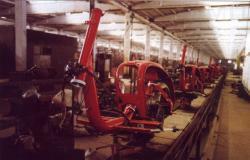 Part of the deal to purchase the scooter production was that Italian technicians and personal were employed to help in the process of moving the whole assembly line over to India and help in the set up of the factory. The Italians were also to train the personnel of the new factory in the production of the scooters. Due to the detailed set up procedure, production did not start properly until at least two years after the purchase, with the initial production staying in Indian. As S.I.L. came to terms with running what was for them a modern production line, so they branched out into export around 1976. 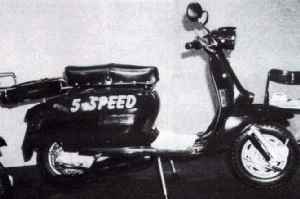 Production was based wholly on the GP range of scooters, although a Cento based model eventually came onto the line. For many years now, the S.I.L made Lambretta's are the only model really to be available to the important markets around the world (Europe and America/Canada). A host of official importers around the world was set up to handle the sales of new machines and spares, but the lack of as with so many other Lambretta licensee's before them, the ability to drive their product forward led to a decline in the world wide sales. Ray Kemp at A.F. Rayspeed, the importer for the UK, did manage to interest the S.I.L factory in his TS1 kit. The Swiss importer also tried in vane to improve the GP, even offering a 5 speed gearbox as standard on his machines. The factory went very close in including the TS1 performance item in the standard model produced, but sadly this never happened. S.I.L now wholly produce the Rickshaw version of the GP and refuse to make any more scooters as they have to stop production of their lucrative three wheeler models to produce a batch. Rumors of the factory, the sale of it, production of scooters, production of rickshaws, parts and a whole host of other items are always rife, stories of Vespa purchasing the factory, machines that produce two wheelers being sold, but at the time of writing the S.I.L factory still remains.